Fall has finally arrived in Alabama! The temperatures are slowly falling and even the trees are beginning to show their glorious colors! It’s one of my favorite seasons, and my cats favorite as well! Sookie, our indoor cat, loves sitting in the window watching the leaves fall from the trees. And Mama Cat, our outdoor cat, is having a ball playing in the fallen leaves! My cats are more than just pets. They are our four-legged feline family members. As such, their health and happiness is a number one priority. That’s why I make sure they eat nutritious food, play with them to encourage exercise, and brush them on a regular basis to avoid hairballs. Unfortunately, Sookie can be a bit picky when it comes to her food, which causes some concern. I want her to enjoy the taste of her food, but still make sure she is getting the nutrients she needs. 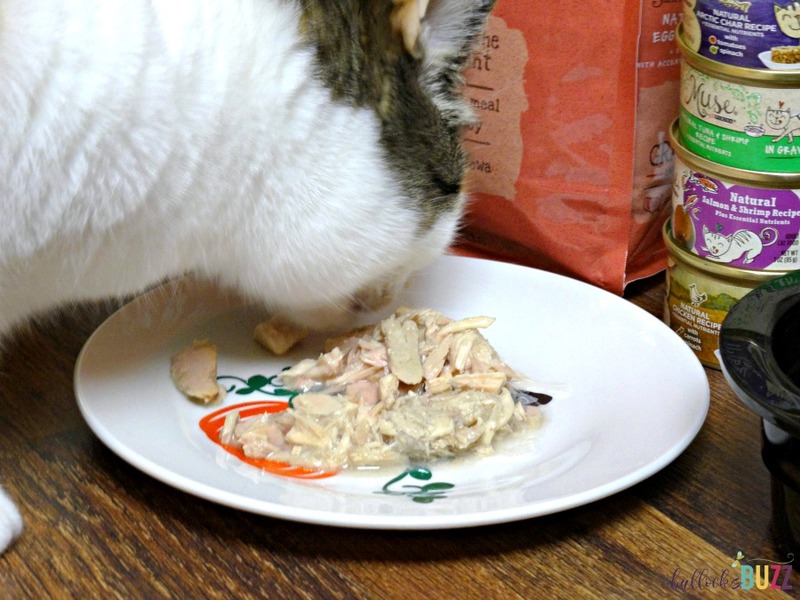 So when I heard about Purina® Muse® Natural Cat Food, and how with Muse you don’t have to choose between natural nutrition and food that tastes great, I just had to give it a try! Purina Muse is grain free, has no artificial colors, flavors or preservatives and all recipes are made with real fish or poultry. It’s available in both wet and dry varieties, and lots of tempting flavors! My cats have been eating it for a little over a week now, and I am thrilled I made the choice! Sookie absolutely loves it, and cleans her plate in no time! 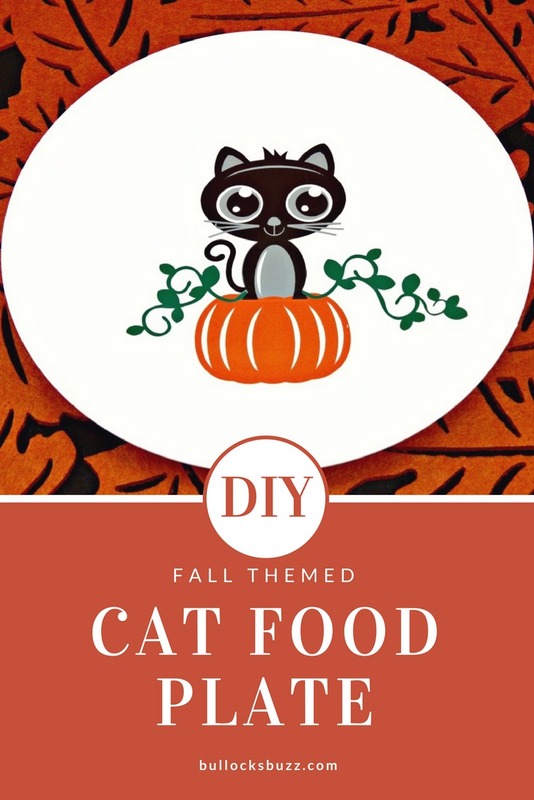 And speaking of plates, this super cute fall-themed DIY Cat Food Plate is a wonderful way to welcome the Falls season! Delectable food should be served on something special, don’t you agree? 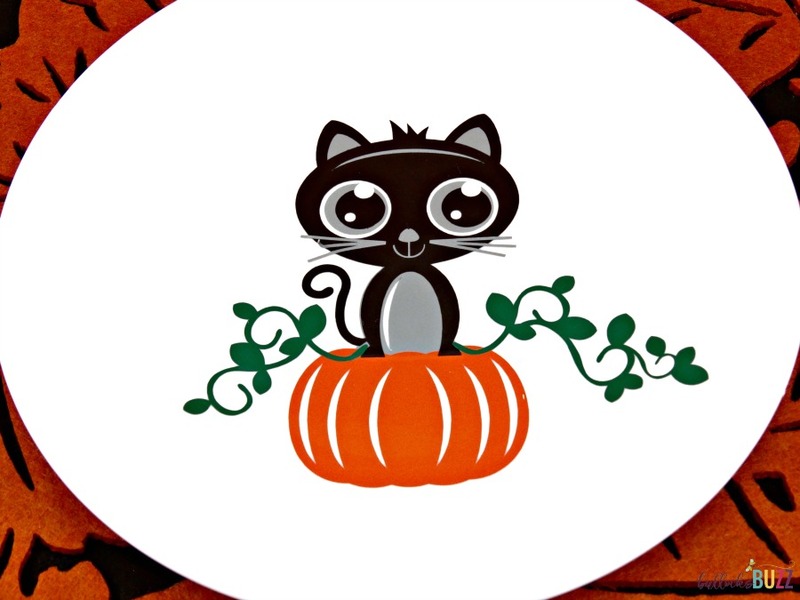 This DIY Cat Food Plate craft is simple and chic and perfect for your family feline. All you need is a simple plate from the dollar store, some vinyl and a die cutting machine like a Cricut. 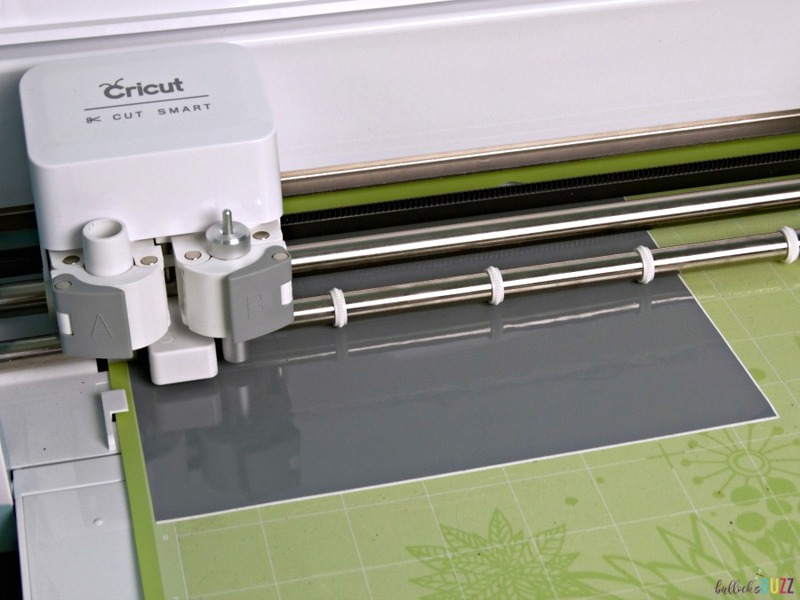 If you don’t have a Cricut Explore Air™ or other machine don’t worry! You can easily use waterproof craft paint instead. Simply download the same file I used (link is below, it comes with a JPG and PDF version as well), print it on cardstock, then carefully cut it out to use as a stencil. Ready to see how to make it? Begin by downloading the SVG file and place it in Design Space or your cutting machine software. 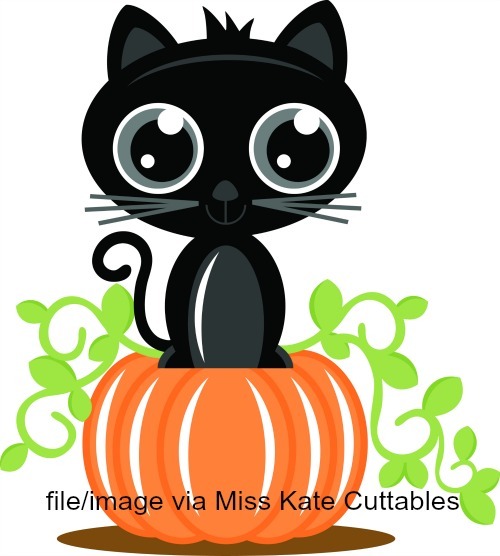 You can purchase the file from Miss Kate Cuttables, and if you hurry, it may still be in the 50 cent store! Next, resize the image to fit whatever size plate you are using. Since I used a 6″ plate, I kept my file size around 2″ high and 3″ wide. 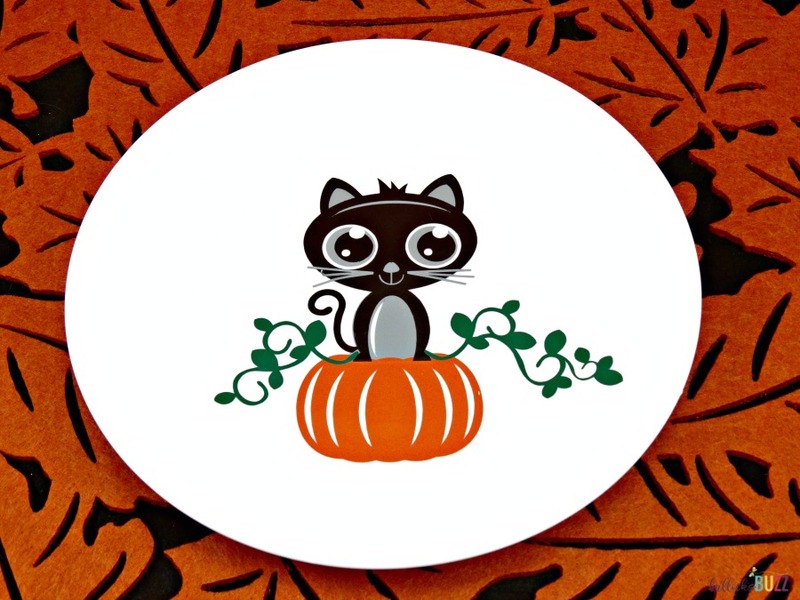 When editing my project in Cricut Design Space, I decided to leave off the brown oval under the pumpkin, but you can do yours anyway you please! Once you have everything sized to fit your plate, it’s time to cut! Make sure your machine is set to vinyl so it will make a “kiss cut” where it cuts through the vinyl, but not the backing. Then sit back, relax and let your machine do its job. 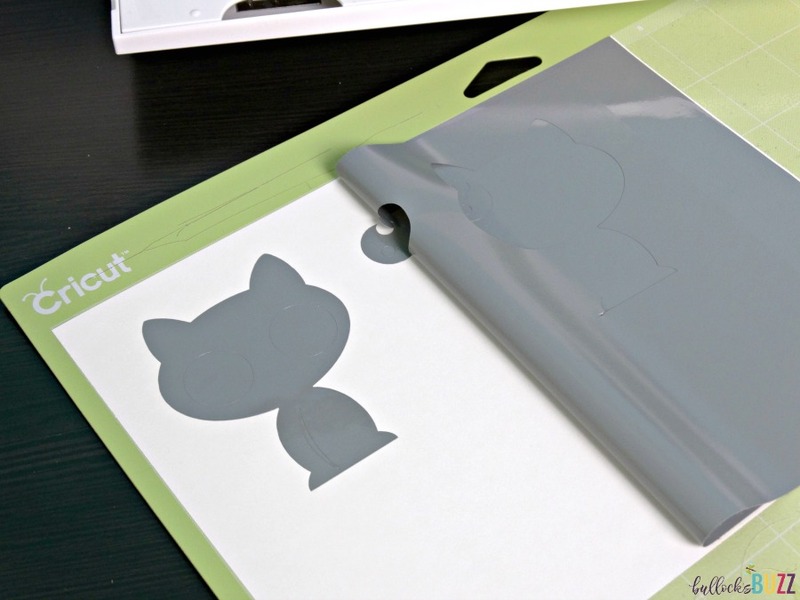 After all of the layers are cut, remove the vinyl from the cutting mat. Next, gently peel back all of the vinyl surrounding the cat and pumpkin that you do not need. Be sure to move slowly as not to peel any vinyl away from the original design. Now, using your hook tool weed the vinyl by removing any excess that is not part of the design. Once you have finished weeding, cut your transfer tape to size. Then peel the backing off of the transfer tape and apply the grid-side over each individual piece of the design. 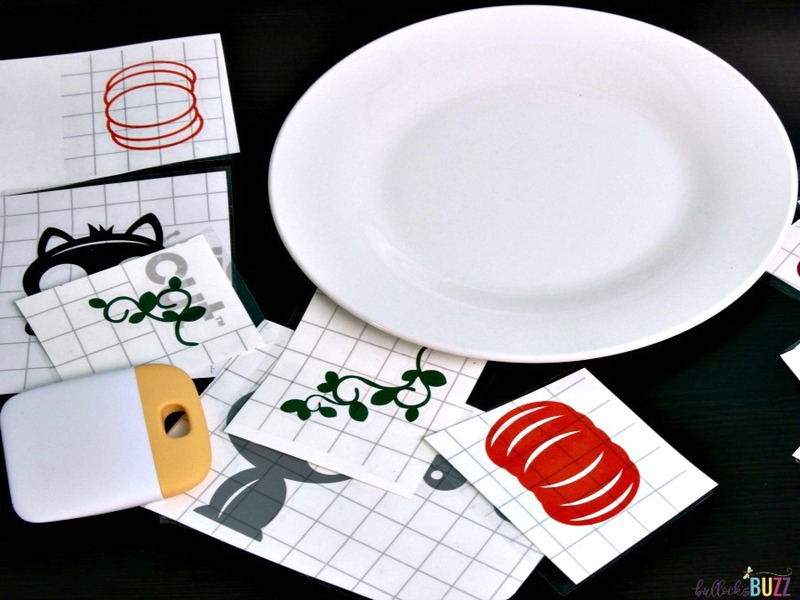 Be sure to burnish it a few times to smooth over your design and adhere the transfer tape. 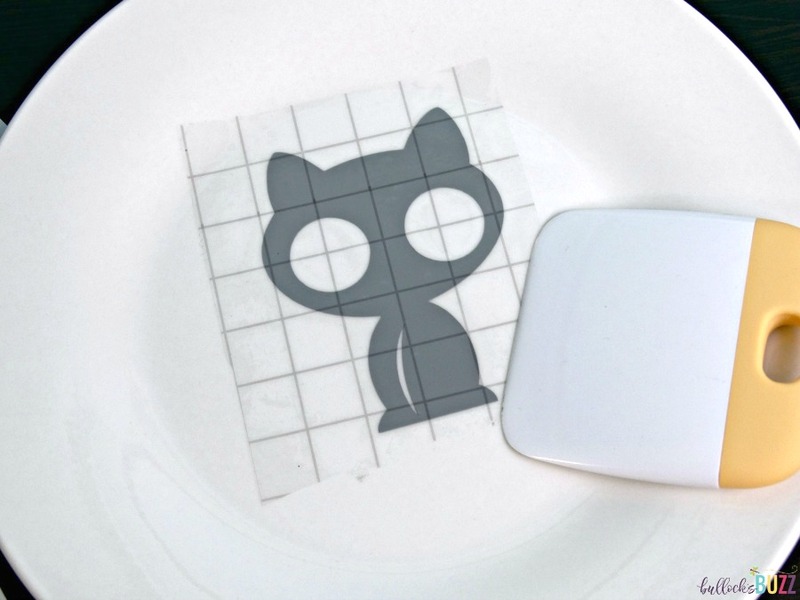 Now it’s time for the fun part – applying the vinyl to the DIY Cat Food plate! This is a layered pattern so be sure you put each layer on in the proper order. 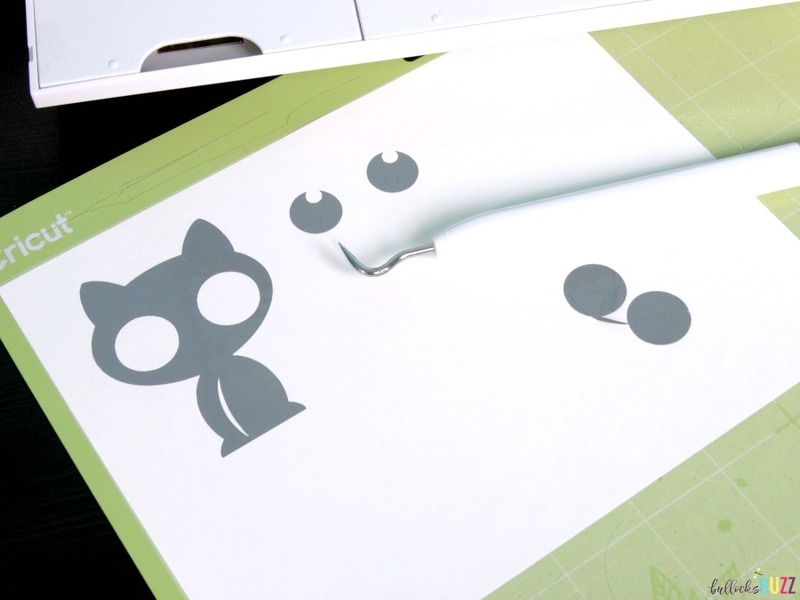 And remember, before peeling the transfer tape away from the vinyl, use your Cricut spatula to smooth over each layer from the middle out to ensure the vinyl sticks securely. Continue adding each layer until the design is completely finished. Note: the file comes with instructions to show you which layer to add when. Once you have all of the layers on, you are finished! 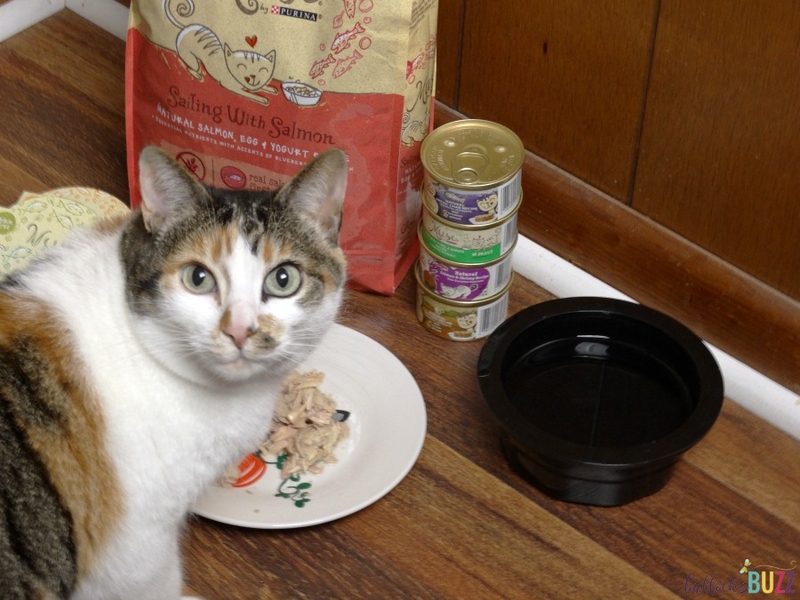 Now all that’s left is to serve up your feline’s favorite food on their new DIY Cat Food Plate! I shop for my feline’s favorite Purina® Muse® at Petco. It’s my favorite place for treats, toys, grooming items and everything else you need to take care of your pet. 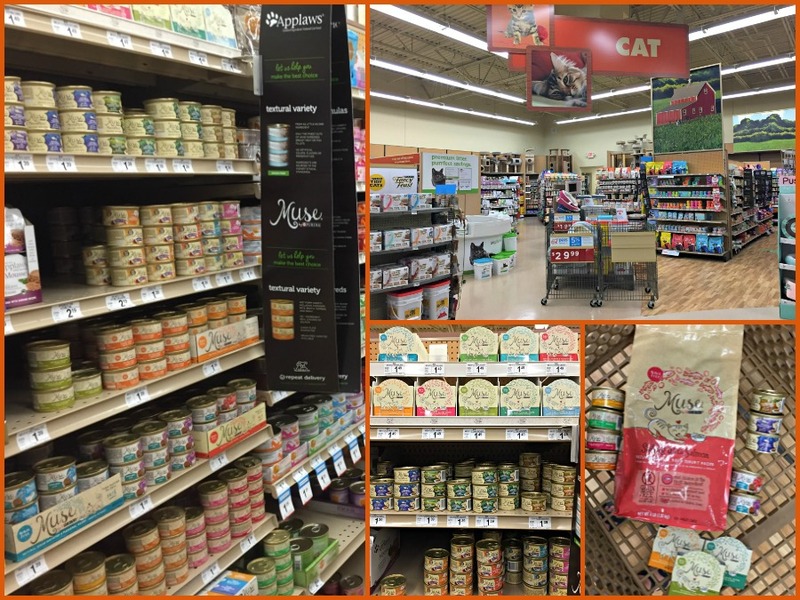 I found a fantastic selection of Purina Muse back in the cat section of the store. And since I feed my cats a combination of wet and dry food in order to ensure good oral and digestive cat health, I had plenty of flavors from which to choose! 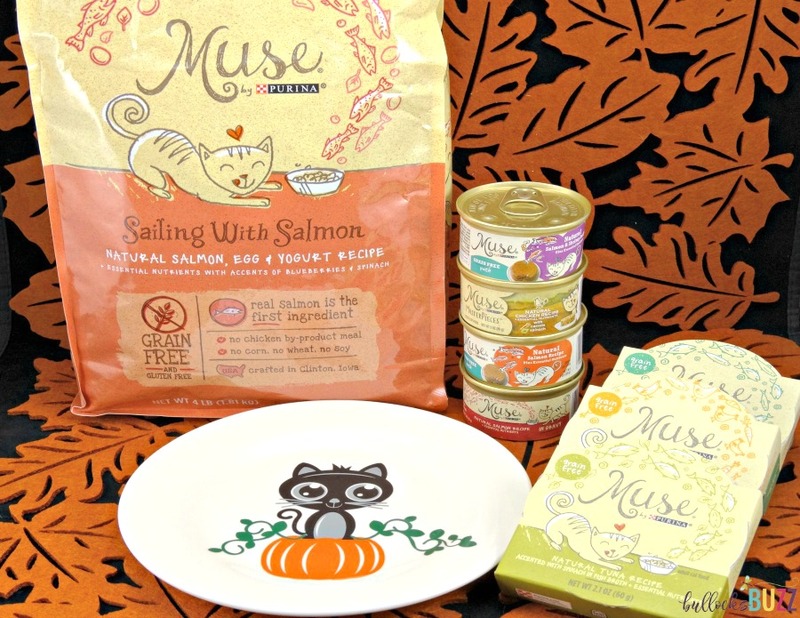 For dry food, I bought the Purina Muse Sailing with Salmon. This is a natural salmon, egg and yogurt recipe, that contains no chicken by-product meal, soy, corn or wheat. Sookie and Mama Cat both love it! Be sure to look out for a new range of Masterpieces Dry Formulas coming in February of 2018! 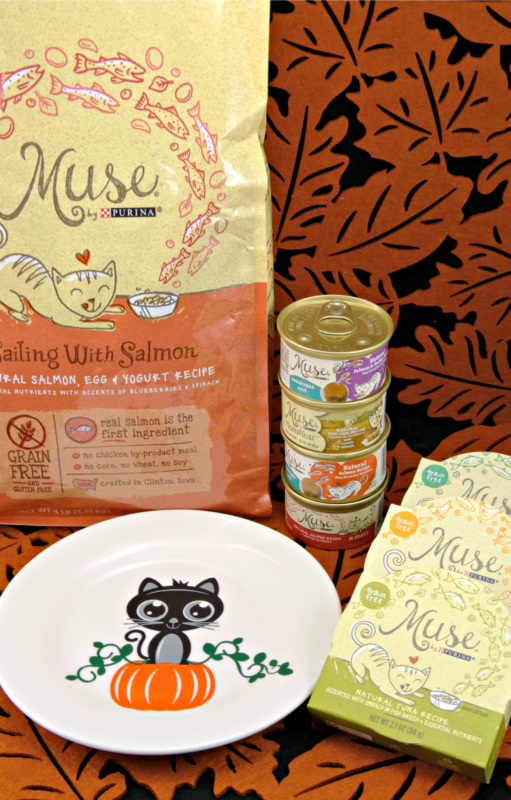 I also picked out several wet food products including Purina Muse Masterpieces which is great for cats who love paté or gravy recipes, and has no corn or soy, artificial flavors, colors or preservatives. It comes in pleasantly surprising proteins like arctic char, quail and pheasant! And I also got her some Purina Muse in Broth. This grain free food is wet food made with real hand-filleted fish or chicken, and contains no artificial flavors, colors or preservatives. I also found all sorts of tasty combinations served up as Purina Muse Paté, Purina Muse With Toppers and Purina Muse Infused. In fact, Purina Muse offers so many tempting varieties and flavors that even the most finicky cat is sure to find a flavor they love! And if for some reason they don’t, Purina Muse offers a Clean Plate™ Guarantee. If your cat says no, they’ll return your dough! Win-win! 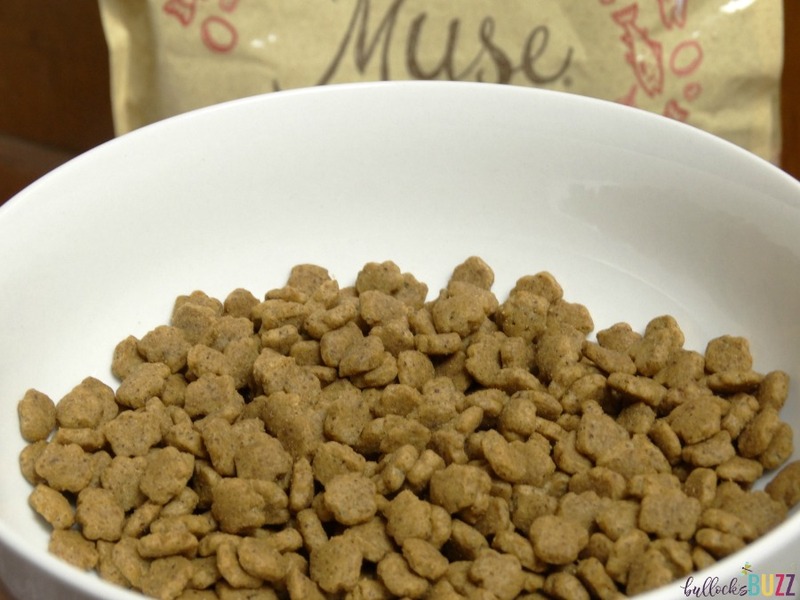 Want to give Purina Muse a try? There are free samples of Purina Muse wet and dry cat food available while supplies last. You can text Muse to 62066 to claim a free sample! Yes, they are a tad bit spoiled, lol. If you don’t have a machine, you could also get the same file (it includes a PDF version and JPG version), and make a template out of it, then use paint! Wow! I can’t believe you’ve made this yourself! It looks like it was professionally or commercially done! That’s fantastic! You should do a DIY video! Just another reason I really need to get my hands on a Cricut!! What a cute idea! Yes indeed I do think my kitties and pups should eat from something special! Right now they have pretty bowls we use but this would be fun to make for them! We do not have cats, but we have two dogs. You are so right, they are part of our family. That DIY plate is just precious! Love how easy it was to create and how personal it is for your sweet cat. Do you seal the vinyl with anything? How cute is that? I love it! I need to get a Cricut, I’ve seen so many cool things made with it. Your kitty is gorgeous, too. I have three cats and they really love the Muse wet food. Even my pickiest cat, Zoe, goes nuts for it. This is absolutely adorable. It is so important to do cute things for our pets. They are family members and need to be pampered and catered to as much as anyone else. Loved this post so much. I definitely agree with Karlyn! I can’t believe you did this yourself (#mindblown). I’m sure feline owners would love to see a diy video of how you did this. That’s pretty crafty! I don’t have a cat but that is something I could try for the kids. They would love to have personalized plates! 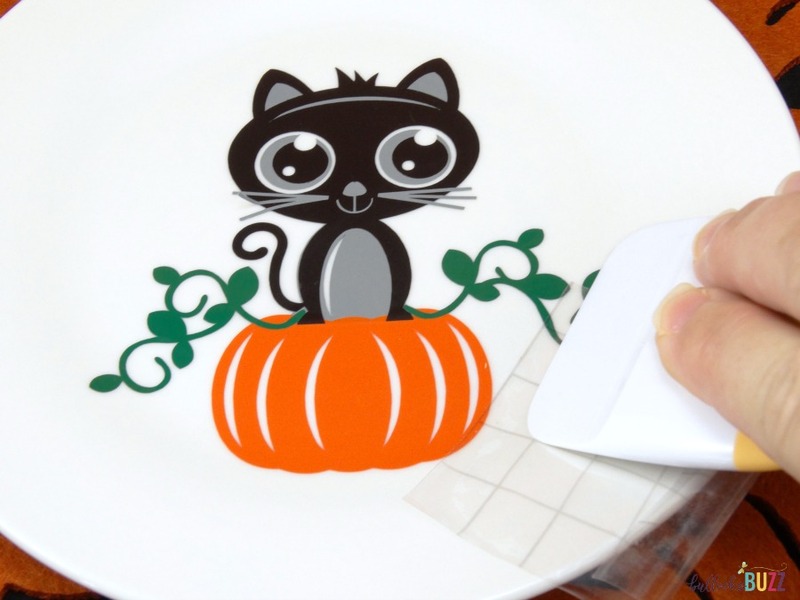 I don’t have a cat, but that is an adorable plate! It would even be a great Halloween themed gift to give someone. Such a great idea. If you’ve been wanting one, do it! They are so much fun! And they’re tons of things you can make with them. I find mine to be a great creative outlet. I love the cat plate!! So adorable!